Home › Electronics › Orange Bolt Infinite X Outdoor Sports Bluetooth Speaker - Waterproof Dustproo..
Orange Bolt Infinite X Outdoor Sports Bluetooth Speaker - Waterproof Dustproo..
360 Degree Surrounding Sounds - Infinite X delivers maximum volume with boosted dual speaker, you also get the complete immersive sound experience of the highest quality. 3 In 1 Multi-Tough Protection - Certified IPX4 waterproof, shock resistance and dustproof. Built-In Micro SD Slot - The SD card will allow you to easily play music whenever you wish without having to pair with any device. Orange Bolt is dedicated to develop the most advanced and robust sportselectronic product on the market. Our vision is to design the mostcomfortable, intuitive, and durable electronic product to maximize yourperformance anywhere anytime. The stylish design infused with the brightestinnovation will rock your world. 360 Degree Surrounding Sounds - Infinite X delivers maximum volume withboosted dual speaker, you also get the complete immersive sound experience ofthe highest quality. 3 In 1 Multi-Tough Protection - Certified IPX4 waterproof, shock resistanceand dustproof. 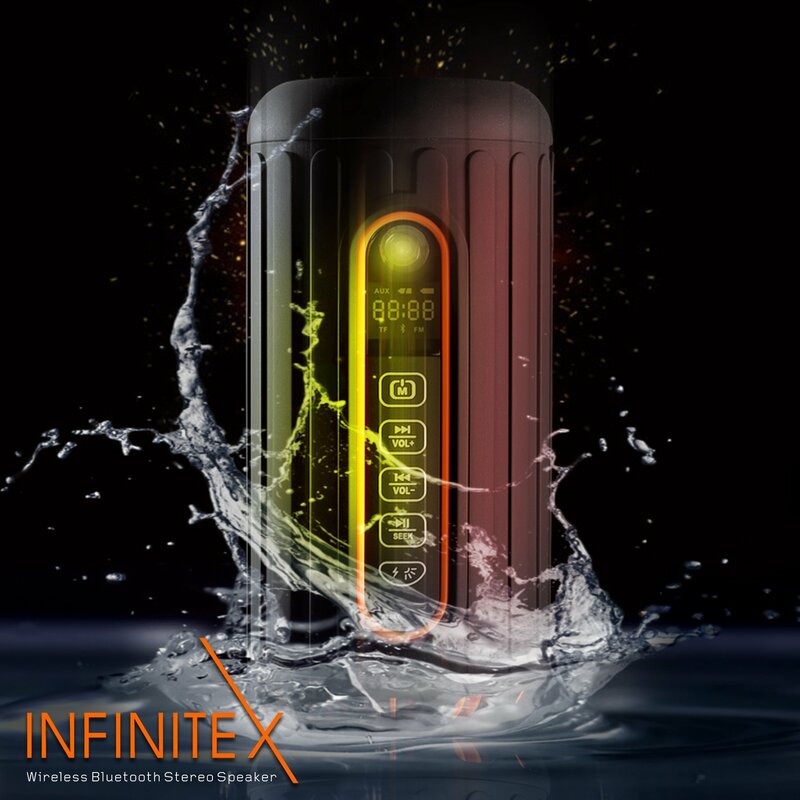 Super Long Battery Life - Infinite X features a 6600 mAh Li-ion battery thatplays up to 30 hours of music, you will no longer need to worry about chargingyour speaker . Flash Light up to 120 Hours - No need to bring an extra flash light, InfiniteX will light up and may save your life, especially in tough times facingchallenge in extreme environments Built-In Micro SD Slot - The SD card will allow you to easily play musicwhenever you wish without having to pair with any device. Built-In Power Bank - No need to worry about power outage, plug and chargeyour phone two to three times Wireless up to 30 ft - Infinite X's outstanding Bluetooth capability is steadyand allows you to wirelessly stream music through any Bluetooth-enabled device AUX-In - Orange Bolt provide an extra AUX cable for you to play your non-Bluetooth device.